The 36th session of the Intergovernmental Committee on Intellectual Property and Genetic Resources, Traditional Knowledge and Folklore (IGC) is taking place from 25-29 June. Yesterday, a first revision [pdf] (Rev1) of a consolidated document [pdf] relating to intellectual property and genetic resources (draft treaty language) was issued. In charge of drafting the revision were two facilitators, Paul Kuruk, vice-chairman, Ghana International Trade Commission (GITC), Ministry of Trade and Industry, and Lilyclaire Bellamy, executive director, Jamaica Intellectual Property Office (JIPO). They were supported by the friend of the IGC chair, Margo Bagley, professor at Emory University School of Law, United States (from Mozambique). They collectively presented the various changes to five articles on 27 June. The five articles of the consolidated text (draft treaty text) that were revised and edited are: Article 1 (Definitions), Article 2 (Objectives), Article 3 (Subject Matter), Article 4 (Disclosure requirement), and Article 6 (Sanctions). Articles 2, 3, 4, and 6 are part of a broader section of the text based on the concept of a mandatory disclosure of the origin of genetic resources and associated traditional knowledge (TK). IGC Chair Ian Goss tries to keep the tone amiable. Football, anyone? 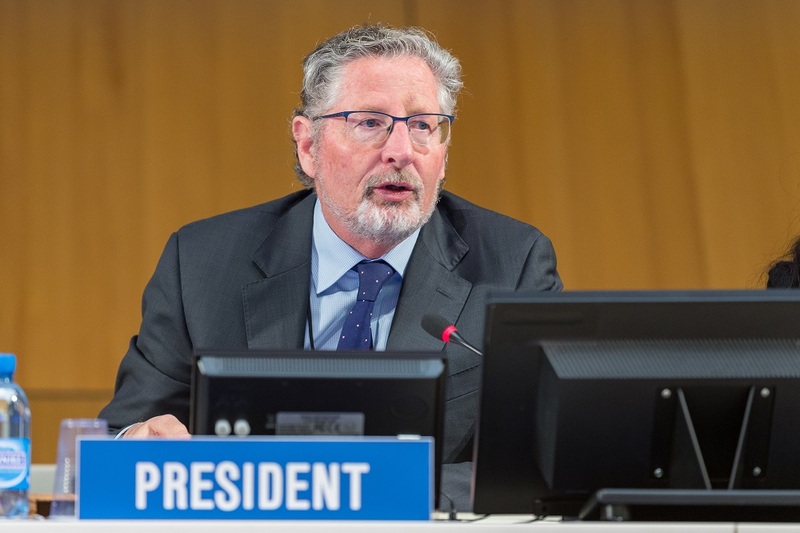 The drafting team sought to find a compromise position based on the outcome of the discussions from three “contact groups”, a new tool for a way forward devised by IGC chair Ian Goss at the last IGC, to allow for smaller groups of discussion feeding into the drafting of revisions, and also on member states comments at the opening of the session, Goss said. Three contact groups were organised this week: one on subject matter, chaired by Faizal Chery Sidharta from Indonesia, IGC vice-chair, one on triggers and content of disclosure, chaired by Jukka Liedes from Finland, IGC vice-chair, and one on the consequences of non-compliance, chaired by Kuruk. A definition of providing country was deleted as it is not considered as being usable in operative articles, Goss specified. During discussions about the revision on 27 June, Switzerland noted its preference for the use of definitions common to several international instruments, such as the Nagoya Protocol on Access to Genetic Resources and the Fair and Equitable Sharing of Benefits Arising from their Utilization to the Convention on Biological Diversity, in particular for terms like country of origin, utilisation, genetic resources, and genetic material. Preston Hardison, speaking for the Indigenous Caucus, said in-situ is a very generic term as it applies to many different circumstances, such as normal use and scientific use, and suggested to use “in-situ natural conditions.” This suggestion was supported by South Africa. Brazil remarked on what they said is an “artificial” division of definitions. Egypt also voiced concerns about the same issue, and called for a “unified” list. Member states have been divided on whether a disclosure requirement should apply to only patent applications, or to other types of IP rights, such as geographical indications, or trademarks. The facilitators, Bagley said, included in the revision a new Article 5 stating that the applicability of a disclosure requirement to other areas of IP and emerging technologies, “shall be reviewed no later than four years after the entry into force of this instrument.” A working group would be established to work on the review. This solution would allow to proceed by step, first concentrate on patents, and then possibly include other IP tools, at a future time period. Japan said they cannot accept the revision as it stands, and asked that the previous formulation be restored. Patents are more relevant to GRs, the delegate said, adding that the country recognises that biopiracy is an issue, but can be prevented by using appropriate examination with the help of databases. Discussions concerning geographical indications and trademark should be left to the WIPO Standing Committee on the Law of Trademarks, Industrial Designs and Geographical Indications (SCT), he said. The United States also supported the previous formulation. Several countries, including South Africa, Egypt, Morocco, and Switzerland, asked that the brackets be removed around TK associated with GRs. Switzerland voiced doubts about the usefulness of this particular article, but said the instrument should also cover TK associated with GR in order to support mutual supportiveness between international instruments. The United States supported the brackets and asked that the alternative, which referred specifically to patent applications be reinstalled. The Indigenous Caucus representative, Preston Hardison, made a strong call to remove the brackets around traditional knowledge. He characterised those brackets as a red line for indigenous peoples. “We have made many compromises,” he said. “We do not reject traditional knowledge databases as we did many years before,” but are just asking for proper safeguards in the construction and operation of those databases. The new Article 5 is a major concession, he went on, providing flexibility to accommodate the interest of all member states. “We demand those brackets be removed, we cannot go forward on this instrument,” he said, “We don’t know why we are even here if there are continued proposals to say that traditional knowledge should not be here, indigenous peoples should not be here, it should just be an instrument on genetic resources” focusing on issues of patentability. “We have an agreement in Nagoya [The Nagoya Protocol on Access to Genetic Resources and the Fair and Equitable Sharing of Benefits Arising from their Utilization to the Convention on Biological Diversity] that the whole of our issues” will be dealt at WIPO, he said, in reference to the inability to agree on IP issues during the Nagoya Protocol negotiations, sending the IP discussions to WIPO. Article 4 on disclosure requirement was edited by the drafting team, and the text of the paragraphs of the article rearranged. One alternative paragraph (4.2) was deleted. This paragraph said the disclosure requirement should not place an obligation to provide information regarding compliance with access and benefit-sharing requirements, including prior informed consent. This suggestion was opposed by other countries, such as Brazil, which explained that derivatives and digital sequence information should be taken into consideration. The expression makes use of is more flexible, the Brazilian delegate said. China remarked on the fact that researchers and inventors know where they obtained the genetic resources they are using. If the country of origin is not known, the patent applicants can still provide information as to where they obtained the resources. The delegate suggested to remove the word “source” from paragraph 4.2. This position was supported by the South African delegate, who added that an addition should be made to this paragraph to say applicants must indicate the origin of the resources they used after due diligence has been done. Egypt and Nigeria concurred. The discussions on sanctions and remedies got impassioned after some countries, such as Switzerland, Japan, the European Union, and the United States expressed disagreement with paragraph 7.2 which states that the validity of a patent should not be affected in case of failure to fulfil the disclosure requirement, unless it results from a fraudulent intention. Switzerland said it was not in a position to support the invalidation of a patent based on non-compliance. The disclosure requirement is a transparency measure in this instrument, which is unique, and would require unique sanctions, such as fines as post-grant sanctions. South Africa said the treaty should not be above the law, as fraud in most societies is considered to be unlawful. “We cannot promote lawlessness” in WIPO, the delegate said. Egypt approved, as did Brazil, which said adequate punishment is needed in case of fraud. It is necessary, the Brazilian delegate said, to avoid applicants being tempted to try their luck if the cost of non-compliance is too low. Excluding revocation is favouring lawlessness, he added. The Brazilian delegate cited the possibility of revocation following fraudulent intention of Article 10.1 of the Patent Law Treaty. This afternoon, the IGC is meeting in closed informal session to further try to find consensus on those articles. "Disclosure, Sanctions – Still To Be Overcome In WIPO Genetic Resources Negotiations" by Intellectual Property Watch is licensed under a Creative Commons Attribution-NonCommercial-ShareAlike 4.0 International License.